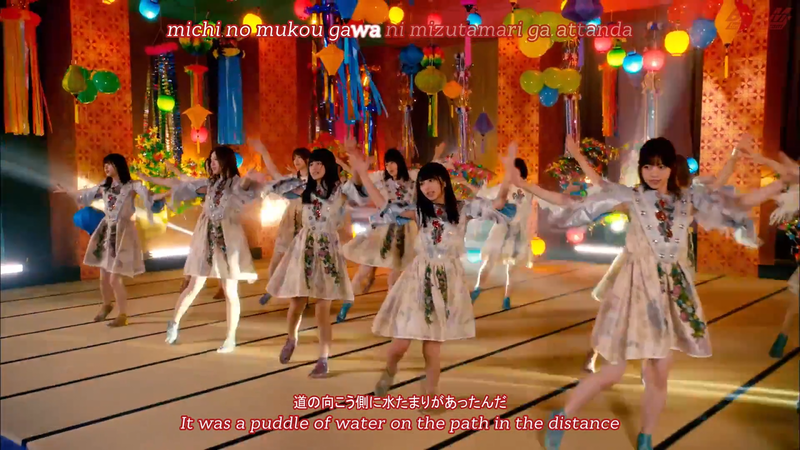 This music video was shot in the start of July in Aizuwakamatsu, Fukushima. The double-centre consisting of the 3rd generation members, Ozono Momoko and Yoda Yuuki, are taken into the mysterious Itami house to be taught how to become waiting maids. They were told that they must never act surprised no matter what they may encounter inside. This video tells the story of their time working as waiting maids. Itami Man: The eldest daughter. She has rice for breakfast. She will never give up this tradition. Itami Nanase: The second daughter. She has bread for breakfast. The fights she has every morning (in relation to food) are stressful. Itami Iku & Matsu: Rice Lovers. There is a rumour that even if it’s not quite rice, as long as it’s tasty, they’re fine with it. Itami Sakura & Waka: Bread Lovers. Due to always eating bread, their stern faces are extremely split open. Itami Asuka: Senior Waiting Maid. She has 2 fractured fingers, but it’s an excuse to be lazy and not work… NOT! She often disappears somewhere. Itami Kazu: She is locked away in her own world, and wishes that someone would understand that… Only Nanase understands Kazu’s situation. Itami Manatsu: She dreams of being a ‘Variety Show Personality’ and wants to be on Japanese TV. She always works hard towards that dream in her room. Itami Miona: She’s a pure Japanese, but she thinks of herself as being Chinese. Her nunchakus are her treasures. Itami Koma & Minami: Haters of filth and germs. Sensitive to manners and etiquette. Two new members have joined, so they’re over the moon at the chance of lecturing to the new members all about the rules and manners. Itami Sa & Shinuchi: While staying in the house they keep their rooms like an office. They do office work like they’re possessed by something. Itami Marika & Sayuri: They wear unique clothes. No one knows what goes on in their heads. They ride segways around the house. Because the video was shot in an unrealistic setting, it was a fun shoot with loads of laughter! I would have loved to watch the coupling Song "Under".